I have been using Pandora for a while and their site is great. It's clean and easy to use and allows you to rate songs using a 'thumbs up/down' scale. You can also bookmark and purchase the songs you like (through iTunes). 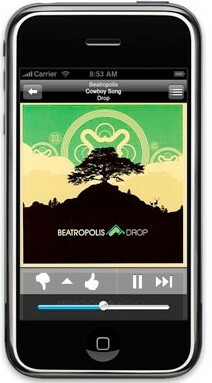 So, I thought I'd try the new Pandora application for the iPhone. Installing Pandora was easy. Although initiating the install was weird (you have to hit a 'Free' button which then changes to an 'Install' button), overall, the process was simple. One thing I really liked was being asked for my Pandora login to make the process easier. "Already a Pandora user?...even easier, just login...Pandora for the iPhone is fully integrated with Pandora on the Web". The application imported all of my stations quickly. Using Pandora was just as easy. Although functionality is a bit limited when compared to the web version (for example, song, artist and album info isn't available), it works great as a 'walk up and use' application. Additionally, the 'look and feel' matches the iPhone well and the album cover art is prominent. Just like the website, it takes one click for you to listen to your stations. My favorite ting about Pandora (for the Web) is the ability to learn what types of music it chooses to play on my station based on Pandora's algorithm of characteristics of the song or artist I've requested it add. However I feel that the feedback of this mechanism is lacking. I would like to be able to pick and choose the elements I like and don't like about a song or artist's style. Sometimes I like just the lyrics but am not totally in love with the harmony, or maybe like the rhythm. It would be great I could give this customized feedforward to Pandora so it has a better model of my likes and dislikes. However, I do agree that the thumbs up/down feedback feature is a great assistant. Great Review Tom! Can't wait to read more!